Our wild agave syrup is produced from various wild agave plants harvested from the country side in Mexico. This product has been well tested in labs and certified by internationally recognized safety and quality of foods organizations. Comparing with the lighter version of agave syrup, this amber wild agave syrup is unfiltered. Because of the production process, it contains more minerals than other types of agave syrup; and it has exquisite, rich and natural flavor. Similar to other types of agave syrup, it is high in fructose, and it has low glycemic level. At Sisana, we provide our wild agave syrup in amber color and in six varying flavors: Natural, Caramel, Maple, Honey, Vanilla and Chocolate flavors. Sisana’s wild agave syrup is a great substitute for refined sugars in most recipes. It is 1.4 times sweeter than regular sugar, so two thirds of a cup will replace one cup of sugar. 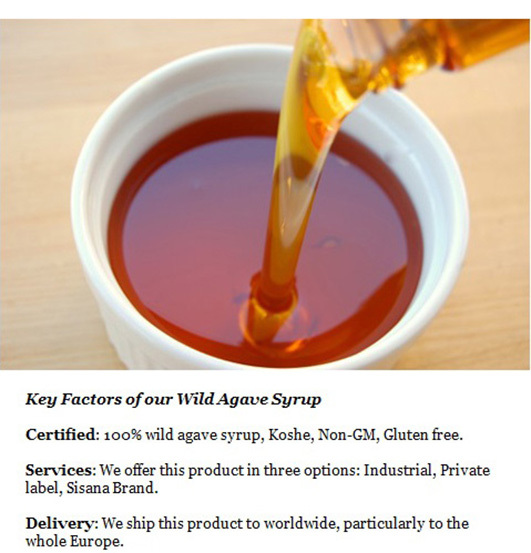 This wild agave syrup enables applicants to use less amount in their recipes, and you can still enjoy delicious treats. For other products of our company, see here. For further reading on the different types of Agave nectar available at Sisana, read here. To meet our customers’ needs, we provide our wild agave syrup in five different types of packaging options: Gallon bottles, Pails, Canisters, Barrel containers and Container-Totes. At Sisana, besides having various of industrial options, we also offer our wild agave syrup in wide range of private label options to our customers. We add refine sugar to foods and beverages, such as using sugars to sweeten cakes and cookies, coffee, cereal and even fruit to improve the taste. However, anything that seriously satisfies our sweet tooth isn’t going to be the epitome of a healthy meal. Fortunately, Sisana can provide you the ideal substitutes which will add more health benefits to your consumers. Sisana’s syrup with a range of customer favored flavors will be ideal options in healthy foods manufacturing and in beverages applications. Agave nectar is 1.4 times sweeter than refined sugar, which allows you to add less to achieve the same sweetness. It has a low Glycemic Index (of 39 or less), meaning that its carbohydrates are broken down and released more slowly, removing energy spikes. There is more information here on the glycemic index of Agave nectar and other sweetener.